1. What are the benefits of implementing SAP HANA with SAP ERP? c) Reduction of O Business Suite stages. d) A provision of BI content. c) O To query existing attribute and analytical views. d) O To make projections on the tables. e) O to perform joins between columns and tables shop online. 3. Which tool you can use to display the data calculation sight? With which of the following would you compare the balances on the report? a) With O balances recorded in the SAP BusinessObjects universe. b) With the calculated O measurements stored in SAP HANA. d) O with the sum of the individual values ​​stored in SAP HANA or in the source system. Please select one (1) correct answer. 7. Which component of the module execution control breaks the request into executable parties? 12. What is the default perspective of IMCE Studio? 13. How many types of export / import can be performed from HANA studio? 14. What is the default schema for the views activated? 15. List based replication ETL? 16. What is SAP BO analysis? 17. What universe is used for semantic layer business? 18. Overview of the data is available with the following options? 19. Identify replication services trigger the DB? 20. Executive privilege can be assigned to assign View? 21. What is the operating system IMDB? 22. HANA Enterprise Server can be configured via the scale up or scale-out configurations. 23. Handling distributed system can not be maintained in HANA since it's just a company server? 24. What is the role in SAP TDMS SAP HANA? 26. Select the appropriate authorization privileges to control the activation of views? 27. network authentication protocol is not necessary to access the HANA server? 28. User Reports clients can not be integrated with users IMCE? 29. The roles assigned to a user are also grantable to other users? 31. Administrators who prefer user controls and create roles schema? 34. Private View Attributes attributes are used to attach the key attributes? 35. Following join types are possible to attribute? 37. What section controls the processing of data in HANA DB? 38. What tool is used to create universes for reporting dashboard? 39. OPD API for data replication is used in which the replication? 42. Modeler also provide a list of users / roles created in the system information? 45. file content can be accessed from the browser of the Administrator Console? 48. 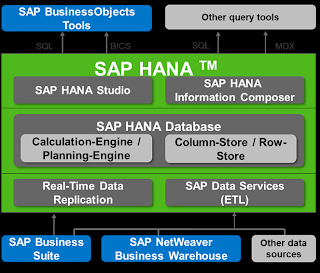 What tool Business Objects is used for data replication to Hana? 51. What is the maximum number of lines by default forward data? 52. The rules of analytical validation of view can be selected and deselected the "Managing Preferences"? 53. A package in a package can be created? 54. Information content delivered SAP models can be activated from? 55. Auto-generates the documentation technical design document in the format of _______? 56. What is the full form of HANA? 57. What non-SAP SAP HANA can connect to? 58. SAP BO Dataservices can connect to any system including OLTP DBMS and RDBMS? 59. Hierarchies with levels of hierarchy are supported due to the attribute? 61. What are the business benefits of ODP for non-SAP BW customers? 63. For SAP BW to be powered by HANA, what are the main steps required? 66. For views of the attributes of time what types of calendars can be created? 67. Filter values ​​are assigned to the 'Data foundation "in the analytical view? 68. Procedures can be created with human Invoker only? 69. SAP Solution Manager is used to provide remote access to HANA Studio? 70. Security and authorization SAP HANA is required to maintain the following? 71. Prerequisites for running Crystal Enterprise reports? 73. Is it possible to add tables later, after the analytical point of view is created? 74. Packages can be exported without affecting delivery units for exports server type? 76. views of calculation can also be used as Business Reporting for? 77. to attribute provides information data base and can be used in any analytical view? 78. 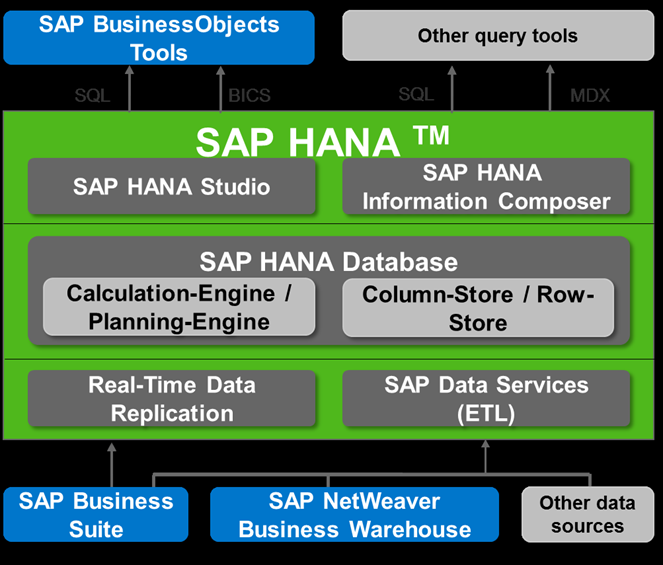 SAP HANA supports the analysis of "big data"? 79. SAP HANA IMDB supports multiple hosts in landspace system? 80. Composer of the information is a browser as the application for end users to create reports?